Cookstown and Pembroke players observe a one minute silence before their EY Hockey League fixture on Saturday in memory of the victims of the Greenvale Hotel tragedy on St Patrick's Day. 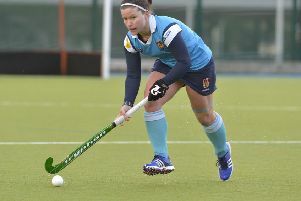 Cookstown enjoyed a brilliant win on the road on Saturday, emerging victorious from an end-to-end match at Serpentine Avenue in Dublin against play-off seeking Pembroke Wanderers. The game started tentatively with both teams feeling each other out but Cookstown took the lead after five minutes. Mark Crooks combined with Scott McCabe down the right with the latter crossing for Callum Anderson to finish with a powerful half-volley. The second quarter saw Pembroke come out of the blocks at pace and put the Reds under pressure with Cian Murphey scoring from a baseline cut back for 1-1. Cookstown settled into a counter-attacking game and won a short after good work from Crooks, Paul Thompson and Michael Kerr. From the resultant flick, Kerr went just wide to leave it all square at half time. Pembroke started the second period stronger and won a short which was brilliantly defended by a combination of Matty Rollins, Godfrey Irwin and Josh McCabe. In the breakdown from this Pembroke opportunity, Cookstown broke upfield with Anderson and Crooks combining to win a short. Ryan Millar’s flick was stopped illegally on the line and despite Pembroke appeals. Millar put the consequent penalty stroke away. Not long after, Cookstown broke away again, winning a short which Millar put away to lead 3-1. Pembroke lifted their play and won a penalty stoke of their own after the ball hit a foot in the circle. Stephen Sweetnam converting. The Reds were able to force a number of opportunities on the counter over the last few minutes of the third quarter but it was Pembroke who levelled it up, Cody Thomas firing in a reverse shot after a pinpoint Harry Spain pass. In a ‘helter-skelter’ final quarter, Paul Thompson went close with a volley for Cookstown while Pembroke’s Greg Chambers missed an open goal. There were a number of cards for the two teams and towards the end the Dubliners pulled their keeper for an extra outfield player. Thankfully, Cookstown kept to their task defensively with Dan Crooks, Jack Haycock, Godfrey Irwin and Matty Rollins in outstanding form. Cookstown IIs had an uncharacteristically flat performance at Strathearn School on Saturday, ultimately failing to fire a shot as Annadale II won 2-0 with a goal in either half. 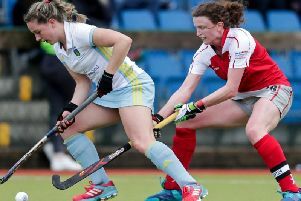 Cookstown Ladies eased their relegation fears with a walkover victory over Kilkeel in Senior 2.